Manicani island was perhaps the most memorable aspect of our visit this year. Due to bad weather, the seas were a bit rough, but we managed to get there in one piece (although soaking wet and with a broken boat). Many excited kids greeted us at the dock, and accompanied us to the center of town. Because the waters were rough, most of the teachers were not able to come out that day to teach classes. The parents and community pulled together to help us gather the children, organize them by grades, and record the children's names. 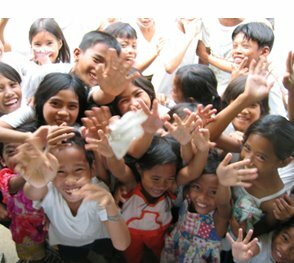 As we passed out the supplies in the first Barangay, children's faces lit up with excitement. They said it was the first time they had ever received any help like this. Some teachers cried, saying that this gave them hope for the children's future and their's. Hello! i am happy to see about the manicani Island in this bolg because i am from manicani too. help one future is an exempt charitable organization under section 501(c)(3). we believe education is vital to growth and that children should have the opportunity to be in an environment where learning can take place. The world is full of opportunities; some people enjoy an overabundance of them while others struggle. Children in particular often remind us of new beginnings, the freshness of life, and hope for the future. Unfortunately, many of these children do not know these feelings and live in environments that crush these dreams. Help One Future was established to aid these children: one country, one city, one child at a time. But how? One US dollar pays for a substantial part of a child’s education in the Philippines for one year. A pencil in the Philippines costs about 8 cents. The average farmer or fisherman makes about $1.75 a day. When you factor in food and taking care of a large family, paying a dollar for tuition for the year may be a possibility, but paying for school supplies as well is a large sacrifice for the entire family. Many of these children are honor students with great potential and academic success. They take pride in their education and they take advantage of their opportunities. Yet they are usually limited by a lack of basic learning necessities such as pencils, paper, and crayons. Even worse, many go to school hungry or take every other year off to work in the fields and help feed their families.